Classic California architecture marries transitional design creating the perfect harmony. This newly constructed John Bianchi estate set on over 4 West Side Convenant Acres features seamless indoor/outdoor living, European Stone throughout, Wide Planked French Oak floors, today’s top appliances, surfaces and fixtures-all the ingredients for perfectly designed dream kitchen and baths. Temp controlled wine cellar, theatre, office, guest house, pool and outdoor loggia. Breathtaking views abound in this light warm inviting estate blending the perfect harmony of scale, proportion and craftsmanship Superior NEW CONSTRUCTION custom estate on the west side of Rancho Santa Fe Covenant with Award Winning Roger Rowe School K - 8 and 4 usable acres with western VIEWS! 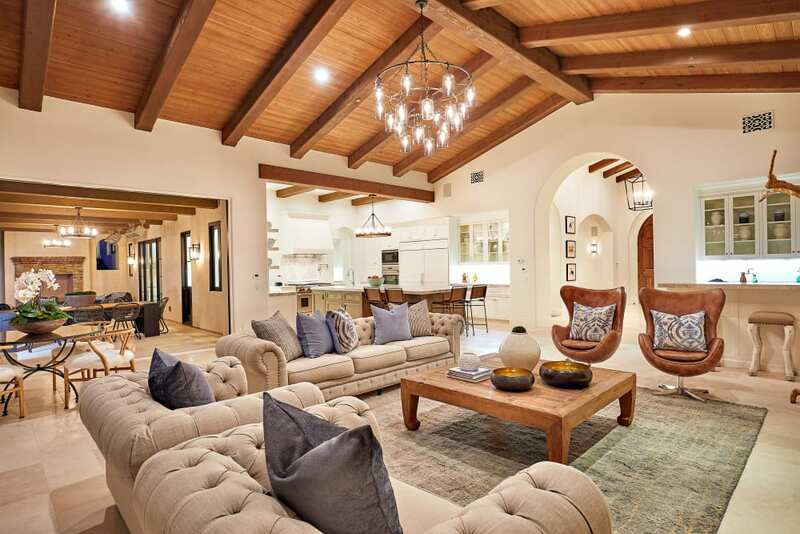 This Modern Classic estate explodes with soaring timbered ceilings, expansive light filled rooms, spacious outdoor loggias, and architecturally defined indoor/outdoor living. The gated entrance with long estate driveway leads to a grand entrance highlighted by a great-room design offering over 9000 sq ft. under roof ease of entertaining and living. The home's features include an unparalleled chef’s kitchen appointed with European stones, dramatic island with prep sink, butler’s pantry with beverage center, and elite appliance suite. Enjoy the custom home theater room, wide plank French Oak flooring, lavish baths with premier lighting accents, sophisticated master retreat with walls of stone mixed with chic marbles, generously appointed closets, optional exercise room, temperature controlled wine tasting room with over 500 bottle storage off of the elegant dining room with designer lighting and groin ceilings, a private office with timbered planks and grand fireplace, optional children's study/game room and all 7 bedrooms offer in-suite private baths.